Heart / brain coherence analysis is based on a unique and revolutionary understanding of the GENERIC PSYCHO-PHYSIOLOGICAL PRINCIPLES that underlie individual experience. These principles are "SIMPLE" in the sense of not-complex (like everyday thought and emotional experience) however SUBTLE. They may psychologically be referred to as supramental or transpersonal, or generally as pre-mental states. They form the universal resource of individual experience, whereas their interactions create actual real-life experience. These principal states or resources are associated with EMPATHY / SYNERGY on the one side, and COGNITION / INDIVIDUATION on the other. Both have a subjective and an objective pole, so there are four principal states altogether. Their combined diagram forms the powerful and inexhaustible matrix (or CAUSAL MATRIX) of individual experience. In other words, it combines the "empathy" vs. "individuality" principles of physiological coherence, with the "subjective" vs. "objective" mental poles, forming four well defined generic principles or pre-mental states. This psycho-physiological matrix forms the basis of heart and brain coherence diagnosis and training. The causal matrix of psycho-physiology has profound implications in different fields. The possibilities and benefits in diagnostics and training (e.g. in a therapeutic or training setting) are summarized here. TRUE HEART AND BRAIN COHERENCE TRAINING PUTS YOU BACK IN TOUCH WITH THE OPTIMAL, ORIGINAL STATE OF BODY AND MIND - THAT WHICH WAS KNOWN IN ANCHIENT TRADITIONS, IS NOW MEASURABLE AND SCIENTIFICALLY VERIFYABLE. Increased, chaotic or even erratic heart rate is commonly associated with EMOTIONAL STRESS, i.e. less empathy, less feeling of synergy and connectedness, feeling of isolation, lack of focus, etc. There is a LACK OF PSYCHO-PHYSIOLOGICAL COHERENCE which on longer terms can also have negative health effects. There are DIFFERENT LEVELS of how the balance can be restored, each with their specific benefits. For the latter two effects one would not necessarily need to measure the RSA, or measure anything at all. A SIMPLE BREATHING PACER alone would suffice. If a biofeedback cue is desired for the RSA, that is, if one would improve how well the heart rate responds the breathing cycle, a blood flow (pletysmographic) sensor can be used. This sensor only produces the physiological heart beat intervals, i.e. not the full ECG spectrum, but this is sufficient. If the monotonous breathing rhythm is viewed as a BASIC BIO-EMPATHIC WAVE (basis of physiological coherence), then training many such waves together ultimately means achieving FULL PSYCHO-PHYSIOLOGICAL COHERENCE. This is heart coherence in the full sense of the term. It includes all wavelengths of the empathic spectrum in a specific harmonic way, and this is called HARMONIC INCLUSIVENESS, directly related to the PRINCIPAL PSYCHO-PHYSIOLOGICAL RESOURCES. Total Harmonic Inclusiveness is a bit theoretical, like for example higher aesthetic and spiritual experiences, i.e. beyond optimal everyday functioning. It helps increasing empathy (sharing yourself, taking part, etc..) while at the same time strengthening your individual focus. Full psycho-physiological coherence can be supported by effective COGNITIVE TRAINING based on the same principles. From a certain viewpoint, relaxation training alone may in fact INHIBIT TRUE MENTAL PROGRESS, i.e. it is only beneficial in reducing emotional stress. During moments of high coherence, the heart rate appears "regular". But in this case it is the result of Harmonic Inclusiveness, not of reduced health or old age. There's a lot of dynamic power hidden in this apparently regular heart wave. Constant regular heart rate however is UNNATURAL and very undesirable. It is certainly not an indication of high coherence - rather is it pseudo-coherence. Healthy regular heart rate is referred to as Internal Cardiac Coherence (ICC). From the same point of view, constant monotonous heart rate fluctuations as in the case of monotonous breathing training are equally unnatural. Regular meditators, depending on their type of practice, may also have a more regular heart rate, especially during practice. If these persons are healthy, that is, they otherwise have sufficient RSA strength resp. heart rate variability (HRV), this can also be considered high psycho-physiological coherence. Using an ECG amplifier to measure the full electrical spectrum, plus special algorithms to detect and reward the natural amount of Internal Cardiac Coherence. This is the principle of the CARDIOGEM. Empathy / synergy vs. cognition / individuation are the root cause and resource of individual experience (..and of all management and leadership theories, and of all health principles, and of life itself..). It is sometimes explained as "STS" (Service to Self) vs. "STO" ("Service to Others"). In these resp. areas, psychology is deeply embedded in physiology and therefore becomes diagnosable. The pre-mental states or conditions can be referred to as the systemic faculties. They are not themselves purely "psychological" in the normal sense, but are essentially different types of PHYSIOLOGICAL COHERENCE. It forms the substantial and inspirational resource of differentiated individual experience. Psychological complexity i.e. differentiated thoughts and emotions emerge solely from the interactions resp. balance between these basic physiological constitutions. This is obviously no co-incidence, but nature has been benign indeed to allow this type of direct access to her innermost workings. Deeply understanding the principles of systemic balance is a powerful method to create transparency in a person's psychology, and insight in how well a person is capable to ACCESS AND UTILIZE THEIR PSYCHO-PHYSIOLOGICAL RESOURCES. The physiological principle of these resources (psychologically referred to as transpersonal or supramental) is "simple" in the sense of not complex as during differentiated experience, thought and emotion. Therefore it is relatively easily diagnosable. It is only the real-life dynamism, interaction and balancing between these states which creates psycho-physiological differentiation and complexity. The psychological meaning of empathy resp. cognition, that is, the systemic balance, is different in relation to the heart resp. the brain. 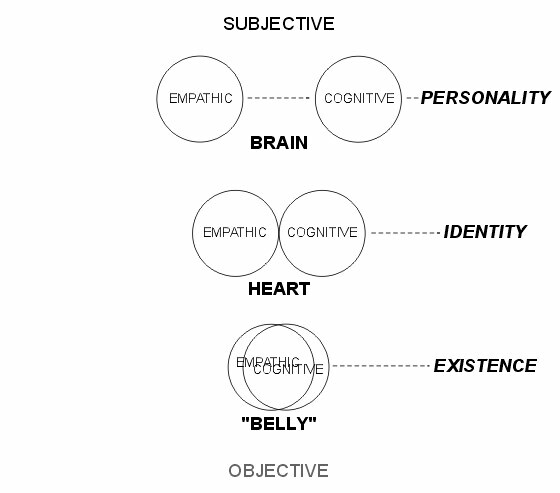 The traditional (social) perceptions "heart means empathic" and "brain means cognitive" ("she follows her heart, but he's too stuck in his head to even notice it..") are somewhat dogmatic and biased. THE HEART IS ALSO COGNITIVE AND THE BRAIN IS ALSO EMPATHIC. However, the reason the heart is commonly found to be more (socially) "empathic", is that the HEART BALANCES EMPATHY AND COGNITION. In other words, there may be less or more coherence, but either way the psycho-physiology of the heart represents INTRINSIC SYSTEMIC BALANCE. This is the holistic ("sacred") effect, the basis of a feeling of IDENTITY. The reason the brain is found more (socially) "cognitive" is that it CAN TREAT EMPATHY AND COGNITION INDEPENDENTLY. In other words, the psycho-physiology of the brain represents INTRINSIC SYSTEMIC DIFFERENTIATION. This has an autonomic effect, creating the basis of PERSONALITY. Thirdly, for the sake of argument one could say that at the abdominal level, there is neither differentiation nor balance between the systemic faculties. They are utterly mixed-up, creating a basic existential feeling and causing instinctual behaviors. So, it is better to say that, in terms of psycho-physiology or simply socially, the THE HEART IS HOLISTIC AND THE BRAIN IS AUTONOMIC. The cognitive function of heart refers to individual focus, commitment, determination and courage ("Lionheart"). The empathic function of the brain refers to creating (social etc..) synergy and unity (which is the ONLY way to truly create something in the first place - all else is just re-assembling..), i.e. in a social context sharing yourself, creating team spirit, service mindedness, being inspirational, creating a sense of purpose, meaning and goal, etc. Therefore, one can say that heart empathy plus brain cognition tells how people ARE, while brain empathy plus heart cognition tells how people ACT. In a psychological sense, "subjectivity " and "objectivity" are usually understood as resp. "personal interpretation" and "absolute fact". With respect to advanced psycho-physiological coherence, subjectivity and objectivity have a broader meaning. Obviously, "synthetic" here does not mean "artificial" but "integral", etc.. The evolution from lower developed mind to higher, is referred to as SUBJECTIVE SYNTHESIS. The empathic vs. cognitive (i.e. systemic) balance essentially works on all levels, that is, in all subsequent planes of subjective synthesis. Generally, GROWTH IN SYNTHESIS = GROWTH IN SOVEREIGNTY = EVOLUTION. However especially on the levels of "capabilities" and "discrimination", the systemic balance becomes more obvious with respect to LIFE STYLE and SOCIAL INTERACTION. Specifically, heart coherence diagnosis and training is aimed at restoring and increasing the systemic balance, building a basis for a healthy, integrated personality. Brain coherence is aimed at personality itself. I.e. specifically empathic or cognitive capacities can be evaluated and entrained. When personality is more developed, the difference between empathic and individualizing tendencies become more evident. This can have a fundamental impact on choices and opportunities with respect to life style and social behavior resp. -capabilities. The causal matrix of psycho-physiology, resp. individual experience can be worked out deeper in terms of psychological characters and their corresponding mental states. This can be used as a guide for therapists themselves, and for cognitive training. Heart: HEART RATE VARIABILITY (HRV). HRV is the result of various autonomous, hormonal and physiological influences. With respect to coherence, HRV specifically indicates emotional engagement, i.e. actively taking part in the various aspects of life. Many years research have shown that healthy HRV is a longevity predictor. Brain: "ALPHA WAVE". The alpha frequency peak (in the range of 7 to 13 Hz) is commonly associated with "mental idling" which essentially means wakeful relaxation. In other words, it lies in-between the more complex mental tasks (beta range) and the generally subconscious (deep concentration, dream, trance, ..) ranges (delta and theta). Without HRV, resp. without alpha "there is nothing to become coherent". Therefore, to be able to do heart resp. brain coherence diagnosis and training, HRV power resp. alpha power are verified and if needed improved first. The unique quality of coherence diagnosis and training is that IT TAKES A PERSON OUT OF ISOLATION - BACK IN TUNE WITH THE SAME COHERENCE PRINCIPLES OF NATURE AND THE UNIVERSE. Coherence in psycho-physiology is about REAL LIFE, and one might even argue that real life is all about coherence. Common physiological and even psychological parameters are per definition isolated, in terms of time, space and person, from the rest of the universe. Psycho-physiological coherence is not a "parameter" - it fully appreciates the entire person in his or her entire periphery - with the idea that both are essentially one and the same. For example blood-pressure or skin-resistance tells something about a person. PSYCHO-PHYSIOLOGICAL COHERENCE IN SOME SENSE "IS" THE PERSON - IN ALL HIS OR HER ASPECTS. This means that a therapeutic or (auto) training session should be as natural, personal and "real-life" as possible. It is not merely a form of "data-acquisition", but a powerful, holistic help with diagnosis, to gain insight, create unprecedented transparency and GET (BACK) IN TOUCH WITH THE NATURAL WISDOM OF BODY AND MIND. For health professionals, this means that you will use coherence training highly INTUITIONALLY, and not in the first place analytically. For clients under supervision, this means that besides diagnosis and (biofeedback, life style, and / or psycho-therapy or other) training, you can get professional cognitive training based on matrix psycho-physiology, to get insight in where you are, where you want to be and how to get there. For a private (home) user, typically in a longitudinal auto training course, you will use the biofeedback in a same way. There's nothing you need to do actively. Let it accompany you and GUIDE you. Your subconscious mind has the wisdom to know what it going on and how to respond. It is just the same as feeling the rush of attraction in nature, or in "sacred geometry", or in the night sky. That's obviously why it is called "sacred" in the first place..! Everything we perceive as beautiful, good and profound is based on the same geometric principles of creation as psycho-physiological coherence. It is not an academic or clinical thing - IT HELPS YOU REMEMBER HOW IT FELT TO BE WHOLE. Obviously, the best use of heart / brain coherence diagnostics and training is supervised auto training, combined with cognitive training with professional evaluation and advise. Familiarize yourself with the backgrounds and be open to a new, holistic yet measurable approach to individual experience aimed at improving life style and social interaction. Familiarize yourself with the equipment and software, and evaluate results while first doing sessions with yourself and people you know well. This is sure to be a great learning experience. Work with your client on a one-to-one basis, meaning explaining what you do, why you do it and evaluating the experience together. Work intuitionally in the first place - only then analytically. Be equally "cognitive AND empathic" as psycho-physiological coherence itself is. Especially for evaluation and life style etc. advice, and cognitive training, familiarize yourself with the advanced topics (below). Ask advice on how to implement heart and brain coherence diagnosis and training in your own practice, or to enhance and deepen your personal method. A person's (and verily every living entity's) empathic vs. cognitive capabilities (systemic balance) are obviously correlated. This relation is not coincidental but very specific and forms the basis of the mental process, which is verily, the mind. In other words, the PHYSIOLOGICAL or systemic states (of coherence) are MENTALLY correlated. Thus it can be said that mental expression / individual experience is the continuous effort of CONNECTING AND ADUSTING THE COMPLEMENTARY SYSTEMIC STATES. This is in fact logical, with the understanding that the mental correlations in this context are well defined. This unique "cross-linked" and cyclic approach was given by the Indian philosopher and social revolutionary P.R. Sarkar, in a series of discourses in 1987. It is important to understand that emotion is always a personal expression, whereas intelligence is a rather universal quality. For example a chimpanzee is obviously more intelligent than a rabbit. Both animals however are basically guided by the same emotions. Only, a chimp has a higher level of emotional integration, that is, emotional coherence. This is not an individual, but a universal quality. In effect, the chimp seems itself more intelligent, but this is universal (evolutionary, ecological, environmental) intelligence, expressing through individual emotional responses. Thought is nothing but coherent emotion and sensory-motoric (perceptual) skills are its most basic form. On the human level it is essentially the same, only there is in most cases a much higher level of subjective synthesis. Cognitive or analytical skills and knowledge alone are not a definition of intelligence. Cognition or knowledge cannot conceptualize or create anything, it can only discern things which are already conceptualized or created. Intelligence in the true sense is as much an empathic as a cognitive capacity. Only together they make the mind advance on the path of evolution, that is, achieve higher levels of subjectivity. Therefore we should not cultivate any ego about being intelligent - intelligence is not ours, it is not something we can gather or store or possess. It is a universal quality, based more on connectedness than on distinction. But we may feel good about having the state of mind that allows us to share ourselves with that universal wave. This in itself is in fact a far more effortless and therefore truly intelligent approach. "Imagination is more important than knowledge" - Albert Einstein, collected quotes. The (psycho-) physiological states referred to as "empathy / synergy" vs. "cognition / individuation" (systemic faculties) are somewhat simplified and do not exclusively apply to the heart or brain. For the heart as well as for the brain within itself, the complete self-reinforcing cycle applies. However, the best approach is to apply the psycho-physiological cycle to the COMBINED HEART AND BRAIN. This profoundly explains the long sought for TRUE HEART BRAIN CONNECTION. Evolutionary, we had a functioning heart before we had a brain. Mentally or psychologically, evolution is a process of SUBJECTIVE SYNTHESIS. That is, ever new planes of subjectivity are discovered and integrated. This process of subjective synthesis has various physiological counterparts. That is, evolutionary it is the universal attractor that creates biology (specifically the glandular and peripheral and central nervous systems). At the same time, subjective synthesis is reflected in achieving coherent states of heart and brain. In evolutionary terms as well as psychologically, the heart's psycho-physiology constitutes the (relative) objective counterpart of individual experience, and the brain the subjective counterpart. This means that heart and brain are psychologically as well as mentally intimately connected. With regard to full-grown, mature psychology, the heart and brain can only theoretically be separated. Systemically, the brain guides the heart cognitively through the RIGHT VAGUS NERVE (controlling regular rhythm through the sinoatrial node) and guides the heart empathically through the LEFT VAGUS NERVE (controlling HRV through the atrioventricular node). The vagus is one of the main parasympathetic nerves of the Autonomous Nervous System (ANS). The parasympathetic system is (evolutionary) a more developed function, compared to the sympathetic system, in the sense that IT ALLOWS HIGHER MENTAL FUNCTIONS TO "TRICKLE DOWN" TO THE PHYSIOLOGICAL LEVEL. The left and right vagus functions with respect to heart / brain coherence are not fundamentally different than in the classical explanation, however the coherence aspects are emphasized. One could say there is a different mathematical emphasis. Synthetically, the heart-brain connection is facilitated by the sympathetic nerves of the ANS. This is evolutionary a basic function, just creating speed of the heart. It is referred to as a synthetic connection, because the sheer activation of the heart forms the objective basis of all (higher) heart-brain psycho-physiology, without being specified otherwise. Yet, in the context of heart-brain coherence, the sympathetic activation does not only imply basic emotional response. It definitely also implies EVOLUTIONARY AND ECOLOGICAL INTELLIGENCE. This can ideally be understood as the bliss of authentically being part of the great natural world. In other words, ideally the natural environment and local ecosystem imparts evolutionary intelligence into each and every living being, which is reflected in its HRV waves. This is the "great wave of life"! Riding that great wave of life marks the difference between "living in a zoo" or "living in the wild". It is also the basis of healthy HRV. Heart - brain connection in the cycle of psycho-physiology. sense the arrows point toward the brain as attractor. Side note: although in terms of healthy psycho-physiology the brain is facilitator (of mental projection) AND controller (of heart coherence), biologically as well as psychologically within its own field, the heart can more or less do without the brain. But not the way around. In other words, there is no way how a healthy "brain-psychology" can develop without a natural heart, because it will have no objective basis and feedback. Despite functioning senso-motoric organs it will never feel that the world is real and therefore meaningful. This is why in mystical terms, the heart is considered sacred and the seat of ensoulment. For it is the heart and not the brain that makes the world and others real. The four pre-mental states together forming the Causal Matrix of individual experience are psychologically viewed as "supramental" or "transpersonal", or in a general sense as "pre-mental". In other words these primary states all by themselves do not define a person's character and personality - they are the same for everybody. Psychologically, a person is formed through birth as well as social and other influences. The Dutch neuroscientist Dr. Swaab went as far as to state "You are your brain" (this is his book title). This is obviously based on lab conditions, as it denies the practical reality and usually longitudinal process of subjective synthesis. We possess the capacity of discrimination (Yogic "viveka") which means that we are also guided and attracted by higher intelligence. In real life, we ideally learn to nurture positive impulses and ignore negative, and that is what makes us grow. We can also learn from Robert Dilts' categories that human psychology comprises more than just behavioral patterns. Our (potential) intelligence is not merely embedded in our heart and brain, it is also implied in our environment. The phase of mental progress from the levels of behavior and capabilities, to discrimination is typically a phase of coping with morality. This is the working field of a healthy society and of standard religion. But from the level of true discrimination and beyond, it is intuitional science - it is not a belief system. Question: should the objective pre-mental states (emotion / emotional coherence and individual focus / determination) be considered "supramental" or "transpersonal"? Answer: from a systemic point of view, yes. From a progressive point of view (subjective synthesis), terms like "supra" etc. imply the subjective level. I.e. increasing subjectivity is "the place we go to", whereas the objective level is "the place we came from". The Causal Matrix of individual experience, resp. of heart-brain coherence, is a systemic-synthetic approach. It is used progressively, but it is not intrinsically progressive. Therefore, with respect to heart brain coherence, the pre-mental objective states are also considered "supramental", however are appreciated as a basis, not as a goal. These archetypes should of course be taken quote-to-quote and with caution. They are meant explanatory or as trends and open to discussion. Heart / brain coherence is empathically not about putting labels. Extreme characters could be understood as to totally ignore or lacking the traits of all others, and especially opposites. In the socio-psychological matrix, compare opposites, especially the cross-opposites, and see how different character types evolve along the line of subjective synthesis. Each mental state has its unavoidable counterpart, however the polarization becomes ever less fierce along the lines of progress (synthesis). Below, in the greater context, the Matrix applied to society resp. civilization as a whole. The matrix of psychological archetypes and their typical mental states, based on systemic and synthetic balance can be used with cognitive training. The suggested approach is: "where are you, where could you be, where do you want to be, how can you get there, what choices and challenges can you expect?". The synthetic scale (vertical) is indexed to indicate the amount of coherence. The systemic scale is primarily related to differentiation due to brain psycho-physiology, i.e. personality. Thus the different character types, their mental states and changes can easily be indexed. This is a new subject, further developments can be expected later.